Emits a high frequency sound, forcing a silithid tank to burrow out from its home beneath the Temple of Ahn'Qiraj. 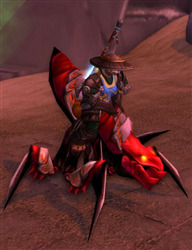 The silithid is obedient to the summoner and can be used as a mount within the Temple of Ahn'Qiraj. Any hostile action towards the rider forces the tank underground.